Most of the discussion on drinking soda has focused on high fructose corn syrup and its detrimental effects on blood sugar and weight. But, what about your teeth? Today, we are taking a page from a kindergarten teacher's playbook (thanks, Greta!). This teacher uses a very visual experiment to help her class of 5 year olds understand what happens to teeth when you drink soda. I have heard that if you immerse a baby tooth in Coke it will dissolve in 24 hours. I checked into this myth and it isn't true. What IS true is that soda contains acid that will dissolve the enamel of teeth over time. Our experiment is simple. 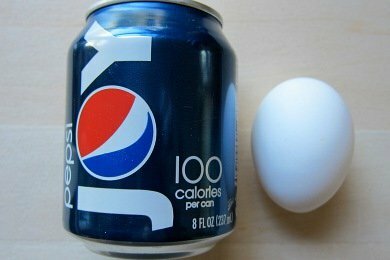 Take a hard boiled egg and immerse it in Pepsi or Coke for 24 hours and analyze your result. The obvious conclusion for the 5 year olds is that you need to brush your teeth. They take toothbrushes and scrub all the color off the egg to mimic brushing their teeth. But, what does this experiment mean for us grown ups? Well, I found a study that concluded that prolonged exposure to soda can lead to significant tooth enamel loss (see here: Acids in Popular Sodas Erode Tooth Enamel). The erosive potential of colas is 10 times that of fruit juices in just the first three minutes of drinking. I doubt this is going to surprise anyone that the powerful combination of sugar, acid, and artificial color isn't great for your teeth. Back in my post on Monster Assault and Mountain Dew, I reported that a kid had over 15 areas of decay on his teeth from drinking Monster. The parents had a $6000 dental bill. YIKES! My suggestion is to treat soda like a treat. Don't drink it very often and when you do - brush your teeth soon after you drink it. Please share this post with your soda drinking family, friends, and co-workers. It might help them kick their habit. Please share your thoughts on this soda experiment. EEK that's terrifying! Nowadays if I drink soda, I can FEEL it making my teeth hurt - hence why I haven't had any in too long for me to remember. The thought of what it does to our teeth is just too disgusting. I love that they're teaching little kids that. Those kinds of visuals are AWESOME. Very interesting. Also, interesting ... if you drink one 12-ounce can of soda per day, this is the amount of sugar you will be consuming annually ... http://bit.ly/awEpYV ... kinda scary. While I agree that drinking a lot of soda is likely not that good for you, this experiment is a bogus demonstration of the impact of soda on teeth. You are comparing an eggshell to a tooth? Other than some staining from the caramel coloring, this test shows no detrimental affect that I can see. I would assume one would see similar staining from coffee, tea, or other brown liquids (Guinness). Again, I am primarily a water and beer drinker who may have an occasional diet soda. Please keep the experiments to ones with measurable results on comparable products. As for the impact on teeth, a lot of things that are good for you also have that impact, like oranges, lemons and other high acid foods. All things in moderation as they say. @Lacedog Since I don't have an actual laboratory - I can't use your suggestion - but I did cite an article that refers to a research paper on the effects of soda on ACTUAL teeth. Do you believe that soda is bad for teeth? Snack Girl - I admit that soda is likely bad for your teeth in large quantities. This badness is due to the phosphoric acid in the soda, not the coloring. I was simply pointing out that your experiment did not demonstrate your claim. Now if the egg shell had dissolved away due to the soda, that would have a least shown its impact on biological substances. Keep up the good blog. I read it everyday. My question is, what about seltzer water? I'm a bit of an oddball - I drink soda not for the sugar but for the bubbliness. I LOVE bubbles. Especially when it's cold, super refreshing! I think that's part of the reason why so many people love soda...not just the sugar, but the refreshing factor of the bubbles. anywayz, I discovered rather early on in my life (thanks to papa-dearest) that I prefer bubbles over sugar (i actually dislike regular soda because of this, hate the sugary after taste, so when i do drink soda I drink diet. I know, I know, i just traded diabetes for cancer, but, uh, moderation yeah? i thankfully don't drink soda of any kind (diet or not) very often), and I stock my fridge with the Safeway brand Seltzer Water (now called Refresh i think). anywayz, does the carbonation in seltzer water also damage teeth as badly as soda? Aside from the carbonation, Seltzer water is essentially water (there's no sodium either, unlike Club Soda). I like this "experiment" and the illustration used by the teacher. Children can be told repeatedly the consequences of something, but having a concrete visual can certainly help get the point across. I love how the children have to brush the egg clean! As for the soda itself, I support the fact that over time it will cause problems. Obvioulsy we don't soak our teeth in cola, but I believe there is plenty of evidence supporting your findings. Love your posts! I look forward to them everyday! I just want to second what Rebecca said about not brushing your teeth soon after eating or drinking something sugary. My husband recently ate a chocolate and I ran off to brush his teeth and I had to warn him that this was actually worse than waiting. The best thing to do is to drink water to rinse off the immediate residue of sugar and then brush a bit later. The truth is that carbohydrates can actually be worse for your teeth than sugar. Sugar washes away easily. Carbohydrates like rice, bread, etc. can get stuck in your teeth or form a residue that does not wash away with saliva or water. Oh my god! I can't even believe that! I may just try it at home! I have decided to check out the rumors what going around in the past few years, and will conduct the experiment myself. I have put my son's milk tooth in a glass of cola and made a picture* of it every day for about 2 weeks, then once a few days. Time by time I have washed it with toothpaste and toothbrush, then replaced the cola with fresh one. For the experiment I use Coca Cola, because that is the most popular cola. Ok, we who drink Pepsi know it stains. An interesting variation on this would be to take off the shell and cut the peeled egg down the middle, to see how much the drink has penetrated the cooked-solid egg white. This is actually not news, there is a recipe (Chinese, I think) called hundred-year-old eggs that uses tea. The egg white turns some shade of golden brown, I believe. Of course, there is no high-fructose corn syrup in that recipe! This doesnt prove anything. 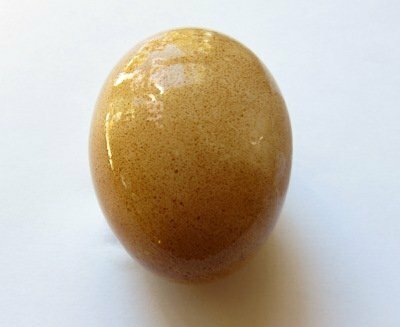 This only shows that the caramel color will stain the egg. The same thing will happen with any dark liquid including "Natural" Things. Drop an egg in tea or coffee (both "natural") and you will get the same result. Drop an egg in a bunch of crushed organic grapes and it will turn reddish purple. If you are going to make "scientific" and "nutritional" claims you really should know what you are talking about.